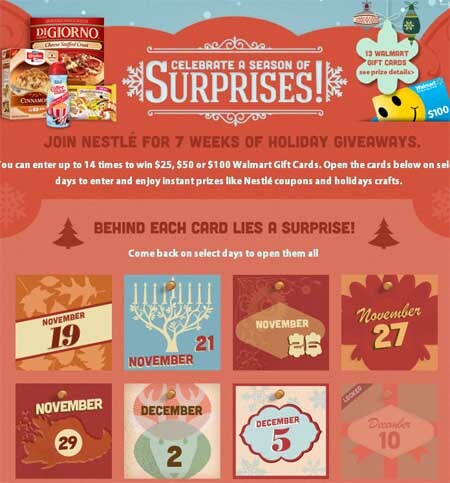 Enter the Nestle Holiday giveaway today and win Walmart gift cards! 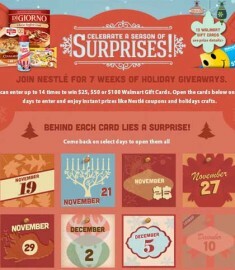 The Countdown to the Holidays with Nestlé Sweepstakes could see you winning some free gift cards. Nestle (esp Hot Chocolate) really epitomizes the holiday season for me, nothing like decorating the house with a hot chocolate and yummy sugar cookies! What is your favorite thing to do during the Christmas holiday season? You can have 1 entry per day on the season of surprises calendar, max 14 entries, there are specific days for entering the Christmas 2013 giveaway so see official rules for all the details. The holiday giveaway ends December 31st, 2013, so don’t delay and enter as soon as possible. Two winner will be selected on Christmas Eve and will receive a $50 Wal-mart gift card and 1 grand prize winner will be selected on December 31st, 2013 and will get a $100 Wal-mart gift card. I love free gift cards, it almost like winning cash, esp when it is a free Wal-mart gift card, you can buy almost anything there! I like to get groceries, I really like the price match guarantee and how they also match the buy one get ones of local competitors! i love love Wal-mart online and have a terrible online shopping habit. It is just so easy to do it! Enter the Nestle Holiday giveaway today and have a merry holiday season! Good luck to all! I need to win so bad to help several families here. My little man has cerebral palsy and it takes alot to keep up with medical equipment and expensies, this would come in handie.